Nearly 700 days have passed. Burroughs has rebounded. He wore his fourth world championships gold medal last August. He won the team World Cup title with the U.S. for the first time last month, the only senior tournament he had yet to claim. Then last Thursday night, atop Pier 17 at South Street Seaport, Burroughs tacked on his first win over Cuban-born Italian Frank Chamizo at the annual Beat the Streets meet. Chamizo took gold at the last two world championships before moving up to Burroughs’ 74kg division this year. 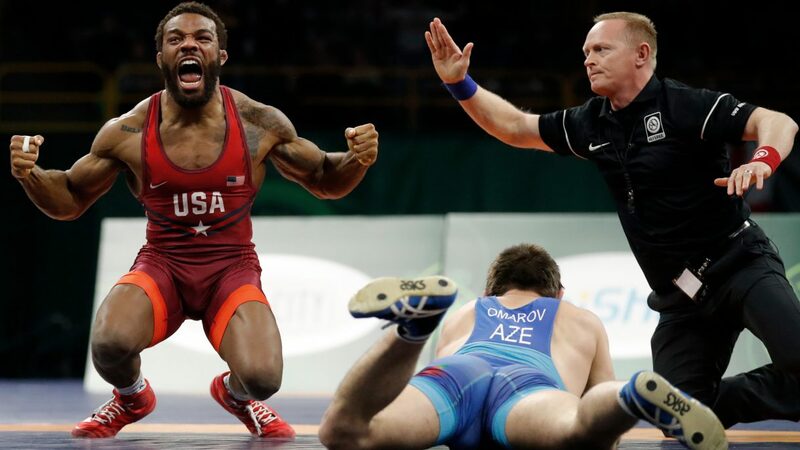 If Burroughs captures a fifth world title in October in Budapest, he will share the record he has for so long coveted — John Smith‘s six combined Olympic and world titles, most by an American. He said none of what he has done since Rio, or what he can do the next two years, will make up for what happened in Brazil. Burroughs distancing himself from defeat is not in character. In 2014, he was beaten by his biggest rival, Russian Denis Tsargush, at the world championships. Burroughs saved on his phone an image of Tsargush celebrating on top of him as a constant reminder and said it motivated him to get out of bed on tired mornings. Burroughs admitted last year’s world title was, at least somewhat, about proving to the world he could still be the best at age 29. The oldest men’s Olympic champion in freestyle between the last two Olympics was 26. Come Tokyo 2020, Burroughs will be older than any previous U.S. Olympic wrestling gold medalist. Last year marked his most difficult path to gold since the match format was changed from best of three periods to a cumulative, two-period model in 2013. Burroughs gave up 17 points at worlds last August, more than twice as many as his 2013 and 2015 titles combined. After worlds in Paris, Burroughs said he hoped the Tokyo Games would be his “final chapter.” Now he’s open to competing beyond 2020, but it won’t be his decision alone. “Ask my wife,” Burroughs said. “I’ve got two little ones [son Beacon, 3, and daughter Ora, 1]. They’re still growing.